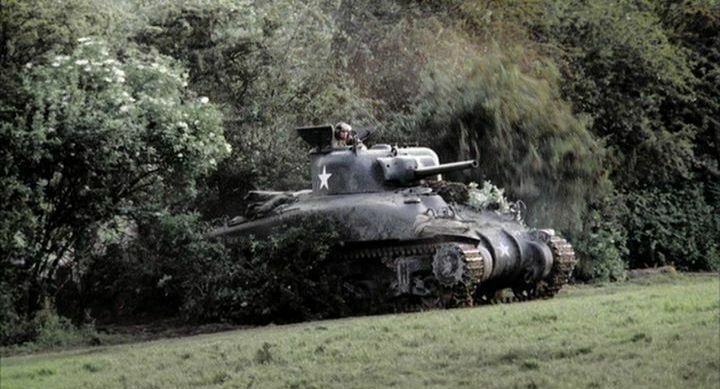 IMCDb.org: 1943 Montreal Locomotive M4 A1 'Grizzly' in "Band of Brothers, 2001"
M4A1. According to the 3-piece nose, 2-piece hatch and rounded hull casting. VVS suspension, and looks to have Canadian Dry Pin tracks. 1018.02 One of the Shermans from the series has been sent to the Canadian War Museum in Ottowa. DaveM"
Definitely a M4A1, possibly a Canadian built version called 'Grizzly' (certainly the tracks are CDP), but it was not made by Chrysler (Detroit Tank Arsenal). - Pressed Steel Car Co.
- Pacific Car and Foundry Co. The 188 Grizzly were produced, to my knowledge, at the Montreal Locomotive Works. should be named as....Tank, Cruiser,Grizzly I..made by Tank arsenal,Montreal locomotive Works, Canada.basically its a Canadian license copy of the US M4A1 Sherman,188 built in 1943..discontinued when there were enough US built Shermans available..those Grizzlys which survive today are painted as US Shermans as here..the last batch of Grizzlys were sold onto the collector market in the late 1980s. It's a slight goof, since the Grizzly was used by the Canadian Army, not the US Army. The British Army used the M4A4 more than any other model, particularly the M4A2.